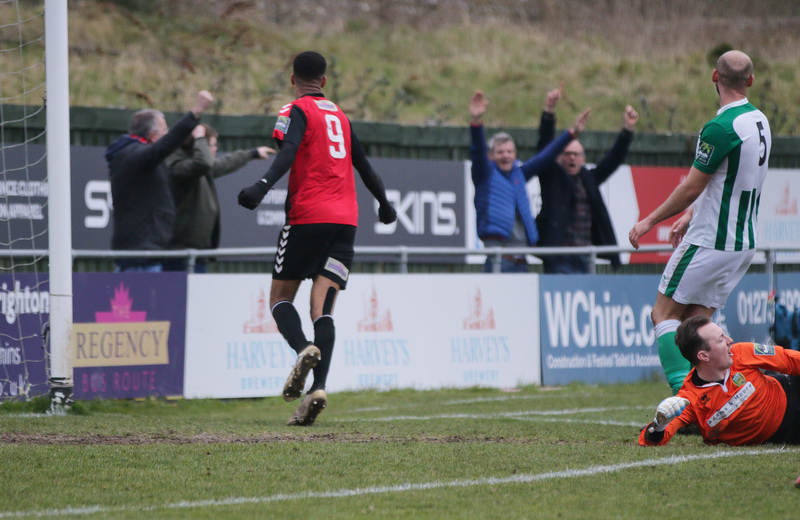 An impressive team performance saw Lewes continue their winning start to pre-season with an emphatic 3-0 victory over National League South side Eastbourne Borough at the Pan, reports Tom Harper. Darren Freeman once again gave two trialists the chance to impress, and was also able to hand a first start of pre-season to last season's top scorer, Billy Medlock. There was little to choose between the two sides for much of the first half, with Lewes moving the ball around well in midfield and looking solid at the back against the pace of the visitor's front line. Borough started to take control of the game in the closing stages of the half, as Charlie Walker forced a smart save from Lewis Carey, before former Rook Lloyd Dawes just missed the target with a powerful effort from the edge of the area. The visitors started the second half as they had finished the first, with Walker drawing another fine save from Carey with an acrobatic half-volley after a long throw from the right had found him unmarked at the far post. Lewes made the most of this let-off by taking the lead after 52 minutes through Jonte Smith, who placed a curling effort into the corner and out of the reach of Mark Smith in the Borough goal after a Leon Redwood cross from the left fell to him in the area. The Rooks doubled their lead midway through the half, as Charlie Coppola teed up Nico Cotton to finish into the bottom corner from just inside the area. Lewes were playing their best football of pre-season at this point, with their one-touch passing and movement in the final third causing the visitor's plenty of problems. They came close to increasing their lead further, but saw the impressive Jonte Smith denied by the chest of his namesake Mark in the Borough goal. Lewes were able to score a third goal to reflect their second-half dominance, as Jonte Smith played the ball out to Cotton on the right-hand side of the area, with the winger taking an excellent first touch to go past the full-back before beating Mark Smith at his near post. The final chance of the game fell to the visitors, but they saw Kane Wills denied by Lewis Carey, before several last-ditch blocks by the Lewes backline ensured the Rooks recorded their fourth clean sheet of pre-season. Darren Freeman was understandably upbeat after the win when he spoke to Barry Collins. Lewes play their penultimate friendly on Monday when they travel to Peacehaven, kick-off at 7.45pm. Lewes: Carey, Brinkhurst, Redwood, Hammond, Chappell, Trialist, Reed, Trialist, Lawson, Medlock, Conlon. Subs: Smith, Elliott, Dukali, Cotton, Blewden, Gifford, Barclay, Parker, Coppola. Eastbourne Borough: Smith, Hamilton, Hall, Wills, Simpemba, Pollard, West, Ransom, Walker, Odubade, Dawes. Subs: Ageymang, Platt, Pickering, Briggs, Ferguson.